1. Whisk together the buttermilk, pumpkin, eggs, sugar and vanilla in a large bowl until thoroughly blended. Whisk in the melted butter. 2. In a separate bowl, whisk together the flour, cinnamon, nutmeg, baking soda, baking powder and salt. 3. Add the dry ingredients to buttermilk mixture and whisk to combine. 4. Melt additional butter in a large nonstick skillet over medium heat. Working in batches, pour batter by 1/3 cupfuls into skillet to form pancakes. 5. Cook on the first side until bubbles form on top, about 1 � minutes. Turn pancakes over and cook second side until lightly brown, about 1 minute. 6. To serve, layer 2 pancakes per person with a layer of apple butter in between each pancake. Place a green apple "stem" in between the pancakes. 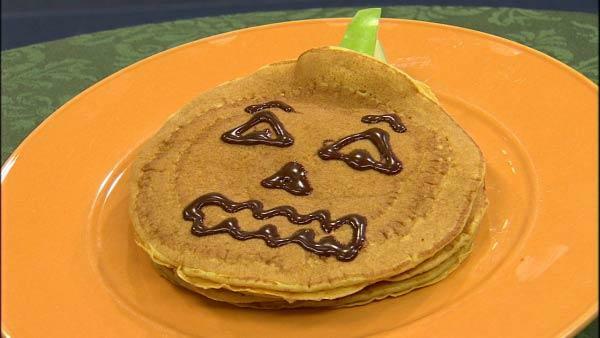 Decorate the top pancake with chocolate icing to look like a jack-o-lantern. 7. Serve with warm maple syrup on the side.